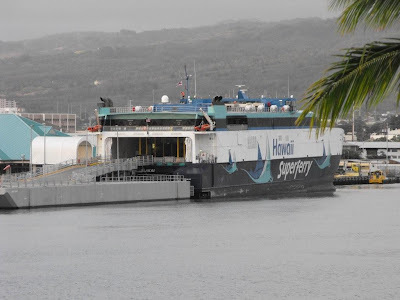 The Navy has received congressional approval to buy two high-speed superferries from the U.S. Maritime Administration. Associated Press. Hawaii lacks a "sense of urgency" about meeting the commitments it made to secure $75 million in federal education funding, U.S. Department of Education Secretary Arne Duncan said Thursday. Civil Beat. The Hawaii Department of Education is struggling to make the grade and now the state has been warned it could lose $75 million in federal funding as a result. Hawaii News Now. Don Horner is retiring as CEO from First Hawaiian Bank at the end of this month and building a second home on the North Shore, but he's hardly stepping out of the limelight. Star-Advertiser. The scene at the Hawaii Labor Relations Board Thursday — one day after the federal government issued a harsh warning to the state about its $75 million Race to the Top grant — was unlike anything that's happened until now. Civil Beat. The U.S. Environmental Protection Agency and the National Oceanographic and Atmospheric Administration say updated computer models show that debris from the Japan tsunami earlier this year could impact the Northwestern Hawaiian Islands as early as January or February 2012. KITV4. Statewide initial unemployment claims dropped 5.6 percent last week, the Hawaii’s Department of Business, Economic Development & Tourism said Thursday. Pacific Business News. These are hardly happy days for Hawaii Democrats. New York Times. The so-called birther movement was dealt another legal blow Thursday when a federal appeals court tossed out a lawsuit challenging President Barack Obama's U.S. citizenship and his eligibility to serve as commander in chief. Associated Press. State Roundup for Dec. 23. Associated Press. State coastal enforcement officials are cracking down on beachfront homeowners whose property landscapes encroach on public rights of way in Kahala and elsewhere. Star-Advertiser. Honolulu City Council Chair Ernie Martin says he will move to have the city join Hawaii's three other counties in banning or regulating plastic checkout bags. Civil Beat. The nearly 1,000 Hawaii Medical Center workers who will lose their jobs when the bankrupt hospitals shut down through the next few weeks are expected to push state unemployment to its highest rate in almost two years. Star-Advertiser. The State has conducted 24 assistance sessions for Hawai’i Medical Center employees facing unemployment due to the closure of two O’ahu hospitals. Hawaii Public Radio. KITV4 News has learned the company that transports dead bodies to the Medical Examiner's office has two convicted felons on its payroll. KITV4. The final numbers are in for firecracker permit sales on Oahu, and they could be an indication that residents are in for a quieter New Year's. KHON2. "We have completed our work. "With that terse comment by Chairwoman Rene Siracusa, the Hawaii County Redistricting Commission on Thursday adjourned its meeting for the last time, not to return for 10 years unless someone challenges the final product. West Hawaii Today. Big Island resident Eric A. Lighter, 61, has been convicted in California of federal crimes including conspiracy to defraud the United States, conspiracy to commit wire fraud, and conspiracy to commit blackmail and witness tampering. Hawaii Reporter. West Hawaii residents homed in on one state transportation project -- widening Queen Kaahumanu Highway -- during a talk story with Department of Transportation Director Glenn Okimoto. West Hawaii Today. Hawaii County could save millions of dollars, generate money and create "green" jobs by privatizing its little-used, multimillion-dollar Hilo recycling facility, the County Council decided Wednesday. Tribune-Herald. Filtration upgrades at the Waimea Water Treatment Plant and replacement of a long-defunct reservoir in North Kohala are in the works. West Hawaii Today. Pacific Wings has petitioned the Federal Aviation Administration to reconsider its award of nearly $2 million in subsidies to Makani Kai Charters to fly into Kalaupapa. Maui News. The new $4.5 million Maui Police Department Forensic Facility will be fully operational before the end of the year. Maui Now. At the blessing of the Andaz Wailea Hotel on Wednesday, on the site of the long-closed Renaissance Wailea Beach Resort, Bud Pikrone, executive director of the Wailea Community Association, said the revival of the property "will definitely help" the image of the resort. Maui News. Maui County Council Member Joe Pontanilla is the latest victim of a vehicle theft on Maui. Maui Now. Construction crew members were retrofitting the Kaua‘i Bus shelter by the Kapa‘a Neighborhood Center this week to accommodate persons with disabilities. Similar improvements to comply with the Americans with Disabilities Act (ADA) will be made at Hanama‘ulu’s Kalepa Village bus stop, county spokeswoman Beth Tokioka said. Garden Island. Kaua‘i Police Department recently recognized three officers for outstanding service: Lt. Richard Rosa, officer Anthony Abalos and officer Colin Nesbitt. Garden Island.